Medieval Bavaria is brought to life during excursions to UNESCO World Heritage-listed towns, where fascinating fortresses tell military tales. Wine-lovers will relish a journey to the centre of the Franconian wine country to taste local produce in the beautiful setting of the Bishop’s Cellar in Würzburg, before an insightful on-board lecture on regional wine. And in Bernkastel, as a fitting conclusion to your trip, you’ll be invited totaste the town’s finest wines within a truly majestic surrounding. 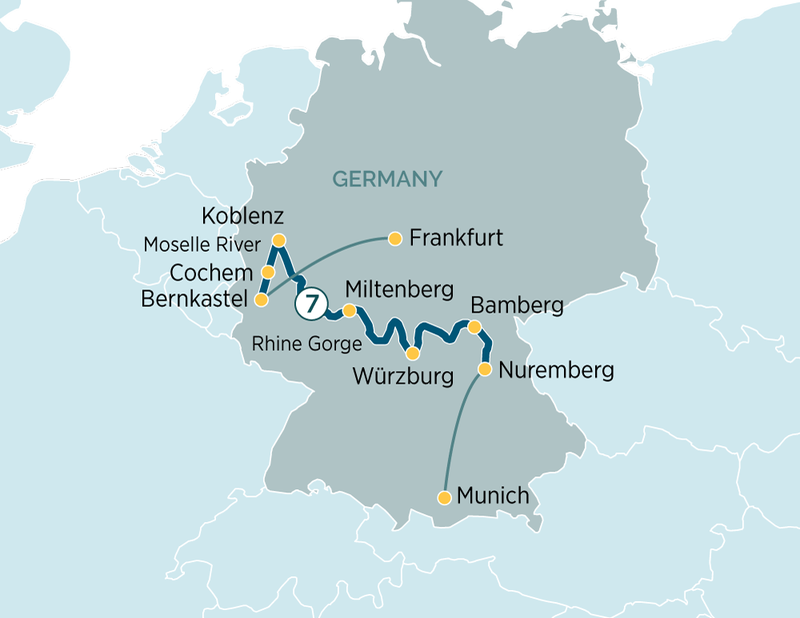 Transfer from Munich Airport to Nuremberg to board your Emerald Waterways luxury river cruise ship where you will be welcomed by your Captain and crew. Nuremberg is situated along the Main–Danube canal, an engineering masterpiece linking the rivers of Germany with the mighty Danube which flows from the Alps to the Black Sea.